“It was in the middle of yoga when I started to notice the guy next to me,” said my friend Sara as we sat in Washington Square Park watching grown men who ought to have known better playing some kind of competitive sport involving flicking small bean bags from foot to foot in time to rap beats. This is not usual yoga etiquette, especially in New York, a city where it’s acceptable to commute ten stops on the subway with your head pressed under someone’s arm pit as long as neither of you makes eye contact. That’s Upper Eastside living for you. It was the second time in as many weeks that someone had brought Arnold Palmers to my attention. I’m British and I drink my tea hot, with a splash of milk, no messing around. Seriously. Do Not Mess With my Tea. But when Wendy started extolling its virtues (cool, delicious, lightly caffeinated) as we sat in a coffee shop in Southampton on a baking hot summers’ day I had to admit, I was tempted. The fact that we also saw Whitney Port in the coffee shop and the fact that she also may well have been drinking an Arnold Palmer was further proof that it was a drink that I needed to try. It converted me in a single sip to iced tea. And the gin version was pretty damn good too. So flush with my success and adventurousness, I put my new popsicle molds to work and made Arnold Palmer ice lollies, which I can recommend without hesitation – especially dipped into a shot of gin as you lick along. This entry was posted in The Wednesday Tipple and tagged Arnold Palmer, iced tea, lemonade, popsicle, tea, yoga. Bookmark the permalink. What a great idea to make them into popsicles! Thanks. I make ice coffee popsicles too, but these are my favorites! These popsicles also make good slush when blended (or half frozen in a plastic tub). Idea stolen from the slushi van at the bar under the High Line at 30th street. They also added a berry slush. Also good – easy cheat; add sorbet, but not a deal breaker. I am recently starting to experiment with popsicles and I will have to add this recipe to my list. I love Arnold Palmers and turning them into a ice cold (literally) treat sounds fabulous for a hot day and I good way to use the mint that is exploding on my porch! I’m glad you like them! 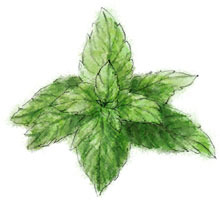 We have a mint explosion too – Jon last night: “we should really have mojitos, you know, to use up some of this mint. Otherwise it might go to waste.” It’s amazing the way it grows.